We recently had a wonderful experience with a pair of Varied Thrushes in Cathedral Grove. The male Thrush had moss in his beak and was likely on his way to the nest. 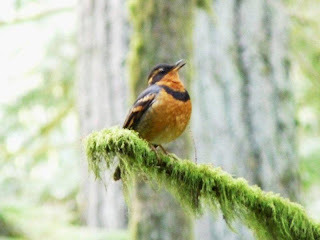 The Varied Thrush is a strikingly handsome forest bird and known to be extremely shy, so we and our guests were delighted to good views while we listened to its most fascinating melancholic, eerie song. Varied Thrush are smaller than an American Robin and there is a black breast band and facemask, orange underparts with, dark gray upperparts, orange wing bars and orange stripe extends rearward from eye. Female and juvenile birds are browner above and the orange is more subdued. The breast band and facemask are a blotchy brown. Cathedral Grove Forest is important breeding habitat for the Varied Thrush because this thrush nests in dense coniferous forest. Two to five eggs are laid in a tree nest. The diet of the Varied Thrush changes from season to season. When breeding, it mainly searches the forest floor for arthropods and other invertebrates, which it often locates by using its bill to flip leaf litter into the air. They will also take a variety of prey, including worms, caterpillars and insects. In winter, its diet becomes especially dependant upon fruits and berries, but also upon seeds. Friday September 18, 2009 we met people at Ravensong Aquatic Centre in Qualicum Beach. People boarded passenger vehicles for the shuttle over the “Hump” then up Cameron Vally logging roads to Mt. Cokely. The cavalcade of people from Oceanside were joined by Hupacasath First Nations and others coming from Port Alberni. Around a 100 people gathered at the old Mount Arrowsmith Ski Lodge location to witness the official opening of the Mount Arrowsmith Massif Regional Park where Hupacasath First Nations representatives gave a drumming and singing blessing and Hupacasath First Nation Elected Chief Shaunee Casavant and Peter Rothermel of the Alpine Club of Canada cut a cedar bark ribbon to mark the historical event. Block 1380, encompassing the peaks of Mt Arrowsmith and Mt Cokely already was publicly owned Crown Forest Reserve however it was declared a Regional Park in November 2008, thanks to the hard work of residents in the area, the Federation of Mountain Clubs of BC, the Alpine Club of Canada (ACC) Vancouver Island Section, the Regional District of Nanaimo and the Hupacasath First Nation. The land was and still is publicly owned land although now gains a higher level of protection. 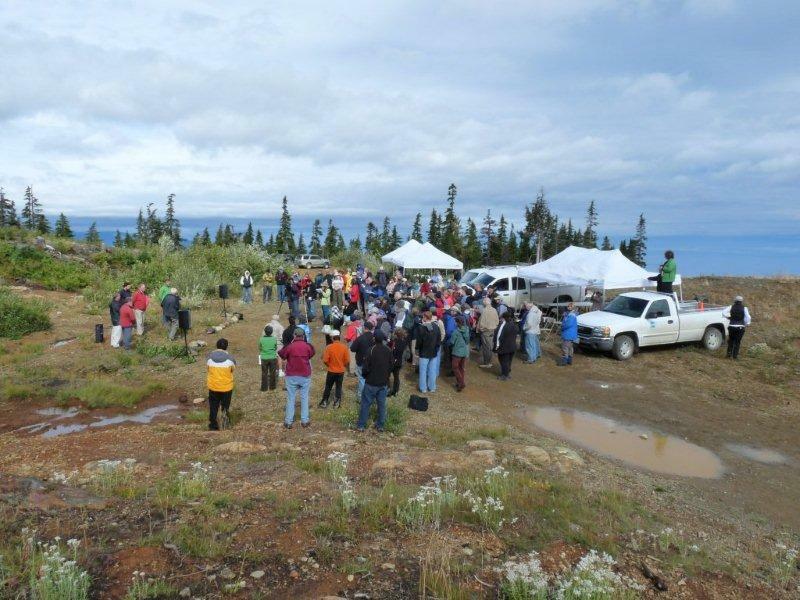 This is an achievement to be very proud of and is the first step in conserving natural areas for important ecological purposes. 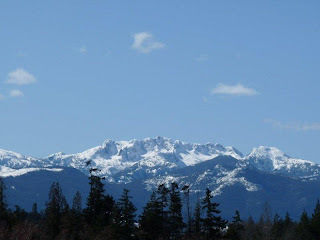 Ecological significance includes the Regional Park's two key salmon producing rivers, the Englishman River & Little Qualicum River, as well as being the habitat for endangered wildlife species such as the white-tailed ptarmigan and Vancouver Island Marmot. Humans are a strand in the web of life and conservation efforts such as this have valuable health and economic benefits for the humans living in the Mount Arrowsmith Biosphere Reserve communities.